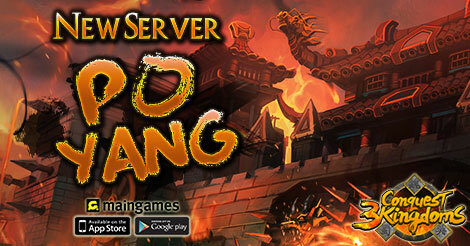 Let's play newest server of Conquest 3 Kingdoms Mobile "Po Yang" ! play and beat all all players around the world to claim your emperor throne! and also become VIP 1! Time：1st-4th Day after the server launch. During event, Topup Accumulation reach certain amount will get certain amount of Gold as bonus. Topup more and get massive amount of Gold Bonus! Eg: If player Topup reach 50000 during event, player can get 8020 Gold Bonus in total. Time：7th day after the server launch. During event, player can get Box reward according to the Conquering City results everyday, the more points you get, you will gift Box you will get. Box Reward：Open Box, random get EXP, Resources, Recruit Order, etc. Time：4th day after the server launch. During event, Iron Worship attempt reach certain times will get Iron Reward and Special Buff! Time：5th day after the server launch. During event, daily refine attempt reach certain times will get extra and special Refine Reward.1、10 Refine Points will get 1 Free Special Refine chance. ※Note: Reward from this event, when used won’t get any Refine Points. 2、Refine equip attempt reach certain times will get Special Refine Reward. Time：6th day after the server launch. During event, if player consume certain amount of Gold to buy Map Resource chance, player will get Iron Scroll Reward! Note: 1 Iron Scroll (L) equals to 50K EXP and 1 SP. Iron Scroll equals to 100K EXP. During event, players who had reached level 55 and above can get certain amount of EXP buff according to their character’s level. During event, beat certain NPC will get massive amount of Gold! During event, conquer certain amount of City will get EXP and Title Rewards. During event, Won certain amount of Duel will get EXP and Title Rewards. Don't wait for too long, be ready to conquer each of kingdoms and get ready to defend your territory only on Conquest 3 Kingdoms Mobile ! when there will be new server coming up?